General William Rupertus’s proud 1st Marine Division charged ashore at Peleliu on September 15, 1944, expecting to cakewalk to victory. It would prove, instead, to be one of the costliest amphibious attacks in American history. Inside the shabby tent that served as his command post on Peleliu, a despondent Maj. Gen. William Rupertus sat on his bunk, slumped over with his head in his hands. As commander of the 1st Marine Division, he had expected to take the little coral-reefed island in the Palau chain in a mere three days’ time. He had even been foolish enough to communicate that optimistic expectation during a pre-invasion speech to his men. However, when his three regiments stormed ashore on September 15, 1944, they found a much different situation awaiting them than the one the general had described. Rupertus did not know it, but at Peleliu the Japanese were unveiling a new strategy. Instead of defending the island at the waterline and wasting their strength on futile banzai counterattacks, they prepared an inland defense amid ideal terrain for such a holding action and resolved to bleed the Marines into nothingness. The new strategy, devised by Japanese premier Hideki Tojo and Lt. Gen. Sadae Inoue earlier that year, was based on the recent string of American successes in the Pacific War. Realizing that Japan simply did not have the resources to stop American advances indefinitely, the pair decided on a plan to make U.S. troops pay dearly for every island they took. Perhaps a negotiated peace was still possible, one that would lock into place previous Japanese conquests in China and Southeast Asia. 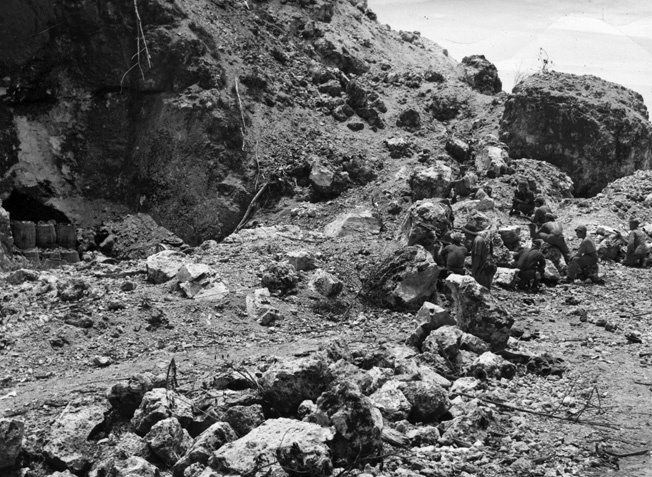 The jagged Umurbrogol Mountains, circled, were the key to the Japanese defenses at Peleliu. Even under ideal circumstances in peacetime, the ground would have been quite difficult to traverse. “There were crevasses you could fall down through,” Sergeant George Peto recalled. “It was a horrible place. If the devil would have built it, that’s about what he’d have done.” It was difficult to find cover, and the nature of the ground multiplied the fragmentation effect of mortar and artillery shells. “Into all this the enemy dug and tunneled like moles; and there they stayed to fight to the death,” an officer in the 1st Marine Regiment wrote. To the Americans, the Japanese cave defenses were unbelievably elaborate. According to one Marine report, they were “blasted into the almost perpendicular coral ridges. The caves varied from simple holes large enough to accommodate two men to large tunnels with passageways on either side which were large enough to contain artillery or 150mm mortars and ammunition.” Some of the caves even had steel doors. All of them were well camouflaged, with nearly perfect fields of fire. Naval gunfire, air strikes, and artillery only had so much effect against these formidable hideouts. Only infantry and tanks could hope to destroy them, and this had to be done at close range, under extremely dangerous circumstances. It was a recipe for heavy casualties—if not outright disaster. From the American perspective, the invasion of Peleliu had been snakebitten from the start. Ironically code-named Stalemate II, the seizure of Peleliu and nearby Angaur Island were aimed at protecting the right flank of General Douglas MacArthur’s long-envisioned return to the Philippines. Disagreements had flared between the Army and Navy over the ultimate goal of the operation. Navy Admiral Chester Nimitz favored bypassing the Philippines altogether to strike at Okinama, Formosa, and the Chinese mainland. President Franklin D. Roosevelt was forced to referee the dispute, coming down on the side of MacArthur. 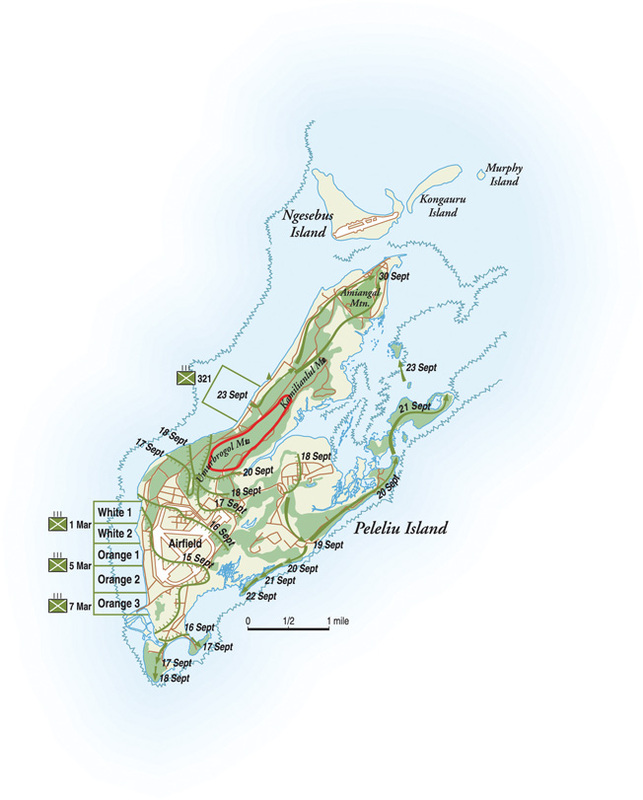 Peleliu suddenly emerged as the red bull’s eye in the center of America’s Pacific map. 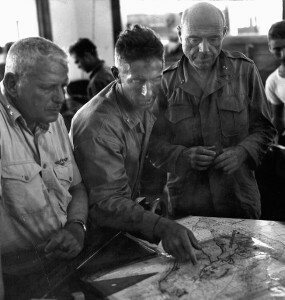 Changes in the time frame, command structure, and combined Army-Marine unit cooperation further hamstrung the operation, to such a degree that Nimitz’s righthand man, Admiral William F. “Bull” Halsey, commander of the Western Pacific Task Force, recommended canceling the invasion of Peleliu altogether. For reasons never sufficiently explained, Nimitz overruled Halsey. The invasion continued apace. Under the agreed-upon plan, the 1st Marine Division landed three regiments abreast on the southwestern beaches at Peleliu. The 1st Marine Regiment, commanded by Colonel Lewis “Chesty” Puller, landed on White Beach at the far left (or north) of the assault. The 5th Marines came in on the center at Orange Beach, and the 7th Marines landed farther south. From the outset, Puller’s regiment experienced the most difficulties. Given the assignment of wheeling left and attacking the high ridges of the Umurbrogol, the regiment advanced only 100 yards from shore before striking the 30-foot-high ridge rechristened “the Point” by the Marines. Major General Roy Geiger, left, and Major General William Rupertus, right, study a map in a captured Japanese building on Peleliu. Many Americans were ripped apart by machine-gun bullets or fragments. Some died instantly. Others bled to death slowly while calling vainly for help. Lieutenant Richard Kennard, a forward observer with G Battery, 11th Marine Regiment, was just behind the lead troops, calling in supporting artillery fire, watching young infantrymen get hit. “War is terrible, just awful,” he wrote to his family. “You have no idea how it hurts to see American boys all shot up, wounded, suffering from pain and exhaustion, and those that fall down, never to move again.” Many times he came close to getting blown to bits by uncannily accurate mortar fire. Marine artillery goes into action in support of the infantry. Because of the Golgotha-like terrain, the terrible casualties, and the chaotic confusion of the fighting, units lost any semblance of organization, deteriorating into little more than random groups of survivors. “There was no such thing as a continuous attacking line,” wrote Lt. Col. Spencer Berger, whose 2nd Battalion, 7th Marines was also being chewed to pieces. “Elements of the same company, even platoon, were attacking in every direction of the compass, with large gaps in between. There were countless little salients and counter salients.” Commanders measured gains in yards. Anything in triple figures was a good day’s work. At night, Japanese infiltrators, sometimes operating in squads, counterattacked the fatigued Americans. The eerie ridges rang with the desperate, animal-like cries of men struggling to kill one another. On the day of the invasion, Colonel Puller’s 1st Marines had numbered 3,251 men. Even before attacking the Umurbrogol the unit had already lost 900 men. By September 21, after just four days among the ridges, the 1st Marines had taken only a few hundred dearly won yards of the Umurbrogol, at the cost of nearly 2,000 casualties. Companies were down to 10 men. Few platoon leaders or company commanders were still standing. Most of the sergeants were dead or wounded as well. Puller had culled out his rear areas of cooks, bakers, signalmen, litter bearers, and engineers to refurbish his line companies, but the Umurbrogol had consumed them too. The 1st Marine Regiment was being destroyed. 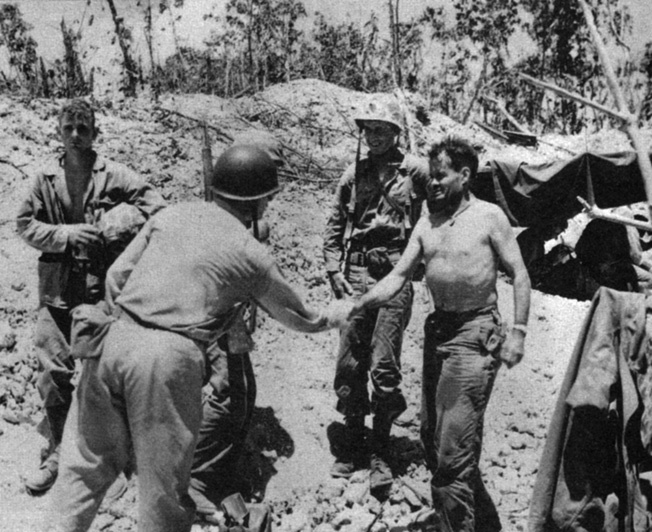 Puller, shirtless in Peleliu’s 100-degree heat, was still carrying fragments from a wound suffered at Guadalcanal. The wound was infected, swelling his thigh to twice its normal size. He walked with the help of a rifle, a cane, or soldiers’ helping hands. Already he was a legend in the Marine Corps, a fire-breathing combat leader who exemplified everything a Marine officer should be. He had come up through the ranks, serving all over the globe with the Old Corps of the pre-World War II era. Basically, he was to the Marine Corps what George Patton was to the Army—a colorful, unforgettable household name who embodied the aggressiveness of total victory. As with Patton, Puller believed in leading from the front. He was a warrior in the truest sense of the word (his detractors saw him as a “warmonger”). Marines blast away at Japanese defenders hidden in their caves. 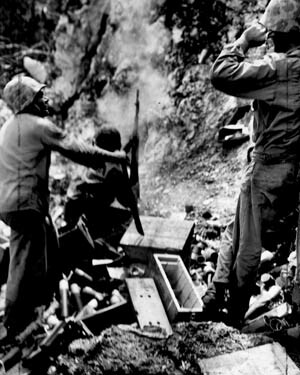 After six days of fighting, the 5th and 7th Marines had largely achieved their objectives, but the 1st Marines were still locked in a hand-to-hand fight with Japanese defenders on the Umurbrogol. The legendary Puller was partly to blame. In his mind, the Japanese were no match for his Marines. He would defeat the enemy by overwhelming them. Although this aggressiveness was generally laudable, at the Umurbrogol it did not serve him well. By and large, he simply hurled his regiment into frontal attacks with few adjustments and little maneuvering, “like a wave that expends its force on a rocky shore,” in the estimation of one of Puller’s officers. Chesty did this with utter, sustained ruthlessness and not much in the way of fire support. To be fair, he did not have much of the latter to call upon, especially artillery. He might possibly have sidestepped the Umurbrogol, working his way up the west coast of Peleliu to encircle the Japanese in their caves, but that would have left the beachhead vulnerable to Japanese counterattacks. Combat artist Tom Lea landed with the Marines at Peleliu and later tried to capture what he saw in a series of paintings. 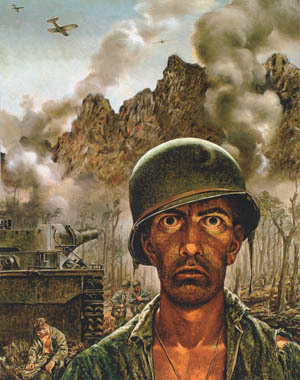 His painting The Two Thousand Yard Stare graphically shows the effect of fighting for Bloody Nose Ridge on one Marine. Still, with all that taken into consideration, Puller seemed to have little grasp of the impossibility of what he was telling his men to do. Day after day, he cajoled, threatened and coaxed his commanders into launching more and ever costlier attacks. When Puller ordered his 2nd Battalion commander, Lt. Col. Russell Honsowetz, to take a hill one day at all costs, Honsowetz complained that he no longer had enough men. “Well, you’re there, ain’t you, Honsowetz? You get all those men together and take that hill.” Puller clearly wanted quick results regardless of the consequences. Amid the bloodbath, he simply would not admit to himself or anyone else that his regiment could not achieve the impossible. Nor did he have much appreciation for the challenging terrain. He even turned down an opportunity to fly over it for a better look, saying he had plenty of maps. Sometimes positive characteristics can actually become a weakness. In this case, Puller represented aggressiveness, valor, and inspirational leadership, all ingredients that make the Marine Corps great. But he also demonstrated the tendency of Marine officers to overrely on these strengths to the exclusion of all else. His repeated, mindless frontal attacks were the American version of banzai—almost as costly, and every bit as fruitless. There seemed to be no end in sight to the carnage, and the longer it persisted the more heavily it weighed on the 54-year-old Rupertus, edging him toward a breaking point. A 30-year veteran of the Corps, Rupertus had once been a champion marksman (he even penned The Rifleman’s Creed). In the 1930s, while stationed in China, he had lost his wife and two of his children to scarlet fever. By most accounts, he was never the same after that tragedy. He grew more reticent, withdrawn, and dour. Earlier in World War II, he had served as assistant division commander of the 1st Marine Division until being promoted to the top job in late 1943. He was aloof from his men and frosty with his staff, especially the able Oliver Smith, whom he treated like an unwanted disease. Rupertus was a poor judge of terrain and tactics. He was rightfully proud of the Marine Corps but allowed that pride to morph into fierce contempt for the Army and the supposed incompetence of soldiers. At Peleliu, his men paid dearly for his interservice chauvinism. 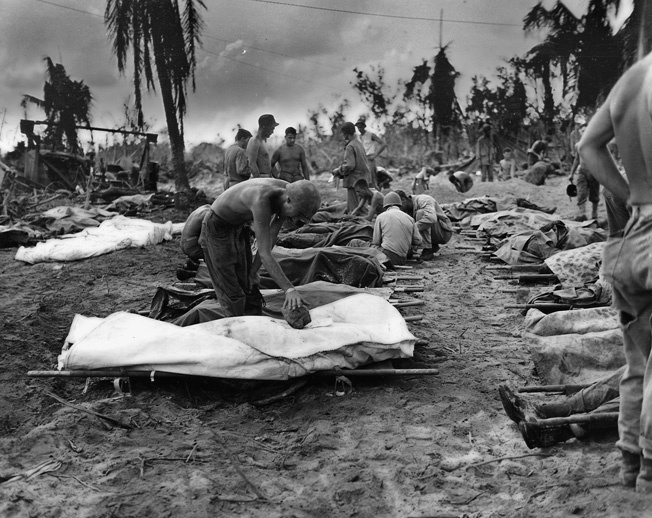 The grim rows of dead Marines attest to the carnage wrought by the savage fighting at Peleliu. Now, sitting on his bunk, Rupertus looked at one of his staff officers and said, “This thing has just about got me beat.” The general was thinking about stepping down and handing over command to Colonel Harold “Bucky” Harris, commander of the 5th Marine Regiment. But the staff officer, Lt. Col. Harold Deakin, sat down next to Rupertus, put his arm around his commander, and consoled him. “Now, General,” he said, “everything is going to work out.” Rupertus could only shake his head sadly and resume his brooding. The general’s main problem was narrow-minded, self-defeating pride. The 1st Marine Division was part of the III Marine Amphibious Corps, under Marine Maj. Gen. Roy Geiger. The other unit under Geiger’s command was the Army’s 81st Infantry Division. Even as the Marines struggled to secure Peleliu, elements of the 81st had overrun nearby Angaur. By September 19, the division’s 321st Infantry Regiment was available to reinforce the Marines at Peleliu. Rupertus knew how badly his division needed the Army’s help at the Umurbrogol. Yet, for days he refused to even consider this option. He was absolutely determined that his division would take Peleliu alone. Geiger, however, thought differently. From D-Day onward, he was ashore at Peleliu. Brave and energetic, he roamed the battlefield, constantly gathering information on what was happening. He had a low opinion of Rupertus and had never gotten along particularly well with him. For several days, he watched as the situation at Umurbrogol grew worse. He considered relieving Rupertus but did not like the idea of firing a Marine division commander in the middle of a fight. Instead, on September 21, he finally took matters into his own hands after a visit to Puller’s command post. Shirtless, with a corncob pipe in his mouth, Chesty limped around on his swollen leg while briefing the corps commander. Colonel William Coleman, a member of the corps staff, had the impression that Chesty was completely exhausted. “He was unable to give a very clear picture of what his situation was.” Geiger asked him if he needed reinforcements and Puller “stated that he was doing alright with what he had.” This was a crucial moment when Chesty could have asked for the help he so badly needed but, like Rupertus, he could not bring himself to do so. General Geiger, back to camera, shakes hands with Colonel Lewis Puller at the 1st Marine Regiment command post. Brigadier General Oliver Smith is behind Puller. Puller’s condition and his tenuous grasp of reality were the final straws for Geiger. The corps commander believed that Puller should have flanked and enveloped the Umurbrogol rather than attacking it head on. Geiger proceeded immediately to Rupertus’s command post and told Rupertus that the 1st Marine Regiment was finished as a fighting unit. The regiment was to be removed not just from the line but from the battle altogether, and sent back to Pavuvu where the unit could be rebuilt for future campaigns. He told Rupertus he intended to replace them with the Army’s 321st Infantry. “At this, General Rupertus became greatly alarmed and requested that no such attention be taken,” Coleman wrote, “stating that he was sure he could secure the island in another day or two.” Geiger overruled him. The battle was over for the 1st Marines, and the Army would replace them. In some ways the divisional commander, William Rupertus, was the final casualty of Peleliu. After the campaign he returned stateside in November 1944 to become commandant of the Marine Corps Schools at Quantico, Virginia. Worn out and shaken by the meat grinder at Peleliu, Rupertus died of a heart attack in March 1945. Tags 1st Marine Division, Admiral Chester A. Nimitz, Admiral William "Bull" Halsey, Allies, Axis, Battle of Peleliu, Franklin D. Roosevelt, Hideki Tōjō, Japan, Japanese, Lewis B. "Chesty" Puller, Oliver P. Smith, Pacific Theater, Roy S. Geiger, Umurbrogol, United States Marine Corps, William Rupertus.